Research shows that students who experience rigorous course work in their secondary schools demonstrate readiness for college-level work and complete postsecondary credentials at substantially higher rates than their peers experiencing less-rigorous preparatory course work. 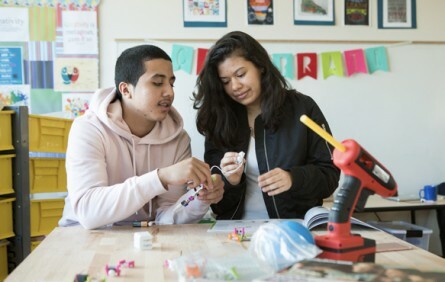 Two efforts, early college high schools (ECHSs) and dual-enrollment programs, offer students the opportunity to pursue college-level credit-bearing course work while still in high school. Generally, ECHSs provide college credit–bearing course work in small enrollment settings intended to boost the level of preparation for historically underserved populations, including students from low-income families and students of color. Meanwhile, dual-enrollment courses may be offered in a variety of settings, including at traditional comprehensive high schools or on college campuses. The ten facts below highlight the impact of dual-enrollment and ECHS programs and demonstrate the importance of continuing to support these programs. Less than 10 percent of high school students participate in programs that offer college-credit courses. 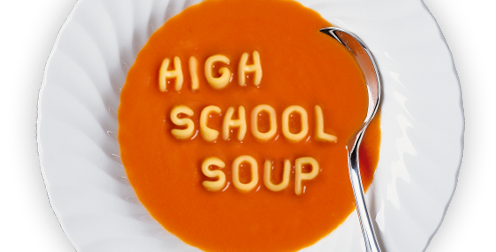 Only 37 percent of dual-enrollment students come from low-income backgrounds. High school educators who teach dual-enrollment courses are as qualified as faculty who teach the same courses on college campuses. ECHS students earn an average of 21.6 college credits by the time they finish high school. Their comparison group peers, in contrast, earn an average of 2.8 credits. Graduates of ECHSs are five to seven times more likely to complete postsecondary credentials within four years of high school graduation compared to graduates from traditional high schools, as the chart shows below. Click to enlarge the chart above. Dual-enrollment students immediately enroll in college after graduating from high school at a rate that is 19 percentage points higher than the national average. In the first year out of high school, students from ECHSs enroll in postsecondary education at a rate that is 38 percentage points higher than students from traditional high schools. Students of color who attend ECHSs are nearly ten times more likely to obtain a college degree than students of color who attend traditional high schools. Among students from low-income families, those who attend an ECHS are approximately 8.5 times more likely to obtain a college degree than those who attend traditional high schools. 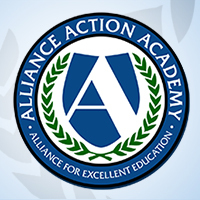 For additional information about the benefits of dual-enrollment and ECHS programs, see the Alliance for Excellent Education’s report Now’s the Time: Early College and Dual-Enrollment Programs in the Higher Education Act at https://all4ed.org/early-college-high-schools-dual-enrollment-pell-grants-hea/. C. Adelman, Answers in the Toolbox: Academic Intensity, Attendance Patterns, and Bachelor’s Degree Attainment (Washington, DC: U.S. Department of Education, 1999), https://www2.ed.gov/pubs/Toolbox/index.html; B. An, “The Influence of Dual Enrollment on Academic Performance and College Readiness: Differences by Socioeconomic Status,” Research in Higher Education, 54, no. 4 (2013): 407–432; R. Breen and J. O. Jonsson, “Analyzing Educational Careers: A Multinomial Transition Model,” American Sociological Review, 65, no. 5 (2000): 754–72. A. Berger et al., Early College, Continued Success: Early College High School Initiative Impact Study (Washington, DC: American Institutes for Research, 2014), http://www.air.org/resource/early-college-continued-success-early-college-high-school-initiative-impact-study-2014. J. Fink, D. Jenkins, and T. Yanagiura, What Happens to Students Who Take Community College “Dual Enrollment” Courses in High School? (New York: Community College Research Center at Columbia University Teachers College and National Student Clearinghouse Research Center, 2017). S. Marken, L. Gray, and L. Lewis, Dual Enrollment Programs and Courses for High School Students at Postsecondary Institutions: 2010-11 (Washington, DC: U. S. Department of Education, National Center for Education Statistics, 2013), https://nces.ed.gov/pubs2013/2013002.pdf. J. A. Edmunds et al., “Smoothing the Transition to Post-Secondary Education: The Impact of the Early College Model,” Journal of Research on Educational Effectiveness 10, no. 2 (2017): 297–325. Fink, Jenkins, and Yanagiura, What Happens to Students; U.S. Department of Education, “Immediate College Enrollment Rate,” The Condition of Education (Washington, DC: Institute of Education Sciences, National Center for Education Statistics, 2017), https://nces.ed.gov/programs/coe/indicator_cpa.asp. Berger et al., Early College, Continued Success. U.S. Department of Education, “Undergraduate Retention and Graduation Rates,” The Condition of Education (Washington, DC: Institute of Education Sciences, National Center for Education Statistics, 2017), https://nces.ed.gov/programs/coe/indicator_ctr.asp. Fink, Jenkins, and Yanagiura, What Happens to Students.